The Electric Company Party Game is a fun and interactive game based on the PBS Kids television show that encourages children to use their imagination in a variety of activities. With the opportunity to have 2-4 players, it also allows kids to play with others on their same team to promote teamwork and sharing. The Electric Company Party Game is a unique virtual board game that includes a spinner, a virtual board, and virtual player options in an easy to use app for children of all ages. The user interface is simple and requires little to no instruction at all. The best part of the app is the audio and narration. The background music and sound effects help to keep children engaged in the activities as they play. The narrator also has a very animated voice that is entertaining as he guides players to their next activity. The illustrations and images included are high quality and done very well and children who are familiar with the television show certainly won’t be disappointed in this app. This app offers many different activities that will allow children to practice skills like putting items in size order, putting numbers in specific order, reading clocks, counting money, and many more. Not only will kids have the ability to practice various educational skills, they also get to use their creativity by drawing various figures and having their teammates guess what it is. Parents will also appreciate how this app encourages children to work together and share the app as it requires 2-4 players per team. The Electric Company Party Game is perfect for families with more than one child as it allows for 2-4 players to be involved at the game. After selecting the number of players, users are prompted to spin the wheel that will indicate the number of spaces their team will be moved on the board. They are then shown the activity that they must complete which could be one of the educational activities or one that is more silly like seeing if your team can lick their elbow. 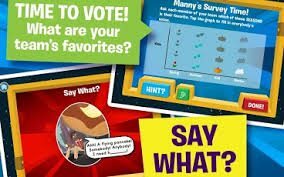 The variety of activities in this app provides a good mix of education and entertainment that children will enjoy and not knowing what activity they will have next makes it unpredictable as well. I think parents will find this is a great game for children to play at any time. Parents will be happy to know they can get this app absolutely free. Not only do children have the opportunity to practice general educational skills, but they can have fun drawing figures and playing other more silly game that will keep them entertained for hours. I think parents will agree this is a great value. Parents will be happy to know this app is free of any advertisements, social media links, and in-app purchases and it is completely save for children. Not only is it safe, but it is also very easy to use and doesn’t require any instruction to get started. Any instructions that are needed are shared by the narrator through the game before each activity so children of all ages can enjoy.